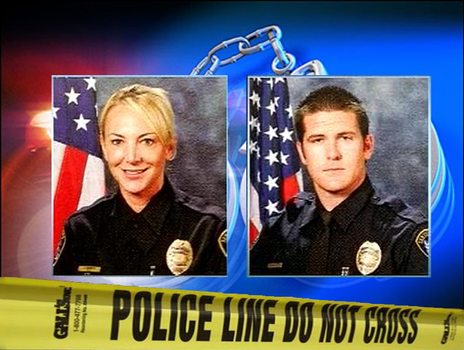 On November 19, 2014, two married San Diego Police officers have pleaded guilty to numerous criminal charges, which included burglarizing homes while on duty and running a hydrocodone distribution network. Bryce Charpentier, 32, and Jennifer Charpentier, 41, admitted to selling and furnishing a narcotic substance, possession of a firearm by an addict, conspiracy to commit a burglary and conspiracy to commit a crime: possession and sale of a controlled substance. Two days before they entered guilty pleas, the corrupt cops were hit with additional charges, which included stealing prescription medication from a parent. During Jennifer’s visit to her mother’s home, she texted her husband to let him know that she was taking her mother into the backyard. While his mother-in-law was being distracted by her conniving daughter, Bryce stole her prescription medications. According to the government’s documents, Bryce then hid the stolen narcotics in a candle and told Jennifer where to retrieve the much-coveted “V.” Less than a month later, Bryce went back to “visit” his mother-in-law, followed by a text he sent to his wife to boast that he was able to steal “a decent amount” of Vicodin from Jennifer’s mother. The couple’s illicit family affair also included offering a drug dealer to take over his hydrocodone distribution network in San Diego County and making deliveries of drugs in the presence of their child. The Charpentiers got married to each other last year and live with their four children. The corrupt cops also stole prescription medications from victims other than their family members. In one instance, Jennifer Charpentier planned to call in a bogus “welfare check” request to the department, so that her husband could respond and attempt to steal medication identified in the message as “V.” The plan didn’t work out, as the intended victim was no longer prescribed the painkiller. In another incident, Jennifer asked a man to allow her husband to use the bathroom in his home. Bryce used the opportunity to pilfer the victim’s prescription medications. The Charpentiers are facing up to seven years and eight months in prison each. San Diego Superior Court Judge Kathleen Lewis indicated she would consider any term, including the possibility of placing the former police officers on probation. Both of them posted $50,000 bail and remain free pending sentencing on January 30, 2015.